Why is blogging on your site important? We are an SEO company with many clients in the Philadelphia area. We’re often told by new clients that they don’t get blogging and why it is important. If you are asking the same question, then read on and you’ll get it! With so many bloggers on the Internet these days, it seems you can find articles on just about anything you need help with. Blogging is a way for you to connect with your readers. Whether you are writing for personal reasons, to be informative or for your business, they are usually written in an informal style, unlike articles you would read in a newspaper or magazine. There are many reasons why blogs work in a business setting. Some companies create personal blogs from their CEO. It is a way to generate content on a personal level. They can blog about their own interests to make readers feel more connected to that company’s Chief Operating Officer and, in return, feel more connected to the company itself. In the SEO world, blogging takes on a whole new meaning. A blog is an excellent content and SEO tactic that will allow you to build your brand, gain traffic and nurture your reputation. If you regularly update a blog, you have an excellent platform to create important content which keeps visitors on the page. This, in turn, boosts a buzz around your site that ultimately boosts your ranking. Search engines seek fresh content and up-to-date websites. More weight is given to recent content on trending topics. Search engines like Google interpret recent updates to mean that a page has more relevance than a website that has not been updated in months or longer. Keywords are the main component of search engines. Keywords are the simple words and phrases that users type into the search engine to find you. However, excessive use throughout your blog article may cause readers and search engines to be turned off causing you to drop drastically in search engine rankings. They are extremely important but only effective if used properly. Keywords should be used only a handful of times throughout the content and be used in a way that they coincide with the piece being written and not like they were thrown in there at the last minute. When you write blog articles, you can promote links within the piece. If a reader is interested in the content and sees a link, it will take them to another related post within your blog content. You can also add outside links that reference the subject matter and give the reader a more thorough understanding of your topic. It is important that the links you choose, however, be valid, useful content and not links to spam. That will quickly turn your reader off and you can surely watch your rankings plummet in no time. Despite the fear of spam-like backlinks, they are still valuable. Google sees them as a demonstration of authority on a website. But it wants to see quality backlinks. Using backlinks in blogs makes it very easy for companies to produce content that answers questions for the users. This, in turn, helps you establish a good reputation within your industry. 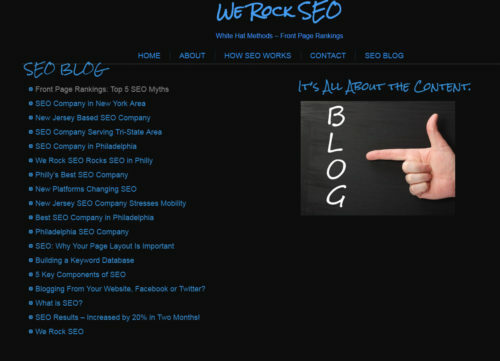 We Rock SEO can help boost your rating with blog articles that will be professional and have meaning. If you need a Philadelphia SEO company to help with your blogging needs, give us a call today.